Many vitamins are destroyed by storing food for too long, and then processing and cooking. 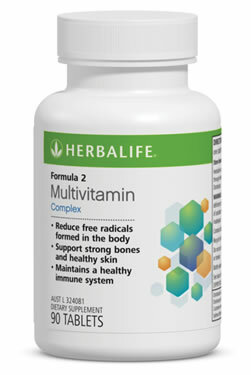 Formula 2 Multivitamin Complex has been scientifically developed to supply your body with over 20 nutrients and antioxidants essential for daily nutritional support and everyday good health. Leading nutrition authorities recommend that all adults should take a multivitamin daily. Poor diet, poor digestion, stress and exposure to pollutants can result in your body lacking essential nutrients. As a result, you may look and feel tired, get sick quickly or have difficulty losing excess weight. Multivitamin Complex with minerals and herbs has been scientifically formulated to nourish your body and support metabolic function at the cellular level. Take one tablet two times a day with meals. May be includes as part of a Herbalife weight loss program..
Supplies the body with 100% of the RDI of the following key ingredients: Vitamins B1, B2, B3, B5, B6, B12, C, D, E, Folic Acid, Biotin, Iodine, Chromium, Zinc and Molybdenum. Includes antioxidant Vitamins C, E, Betacarrotene and Selenium to help fight free radicals generated daily through stress and pollution.